Raising prostate cancer awareness was the theme of my National Prostate Cancer Awareness Tour which I began last June with African-American off-Broadway actor, Kevin Byrd. At that time we went “on the road” together with Dr. Robert Carey, starting in Sarasota, Florida. I just received some breaking news from Kevin in the form of a press release. 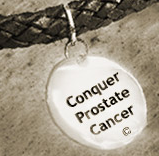 It refers to today, February 2, 2010, as the second annual International Prostate Cancer Awareness Day. As the press release segment I'll cite indicates, you can look forward to this international event every February during Black History Month. PR Log (Press Release) –Breaking News February 1, 2010– International Prostate Cancer Awareness Observance Day, proclaimed on Tuesday February 2nd, 2010 honoring BrownByrd Prostate Cancer Foundation’s CEO & Founder Actor Kevin Byrd during Black History Month. On February 2nd, 2010 we ask citizens and community organizers to join in this 2nd Annual Historical Observance Day to recognize the importance of raising awareness about the severity and prevalence of prostate cancer. We ask all citizens to pray and observe 19 seconds of silence, wear a blue ribbon or light a blue candle recalling the thousands of men who lost the battle against this insidious disease. By continuing our fight for this disease on this day we pledge to make ours a healthier and more peaceful world. It should be noted that between June and September 2009, Kevin Byrd and I launched the beginning of a 12 city National Prostate Cancer Awareness Tour. As he wrote in his press release today, he joined me in my capacity as an Amazon Best Selling Author of Conquer Prostate Cancer, along with joining prostate cancer surgeon, Dr. Robert Carey. Kevin Byrd is the youngest African American Male under 30 years old to have been honored with a record-breaking 80 prostate cancer proclamation awards throughout the United States and other parts of the world.